The Las Vegas Massacre is the worst gun related killing in the modern history of the United States. The nation is in shock. The questions are many, the answers from authorities are few and not satisfactory or responsive to the many important questions being posed by the public and the press. One of the primary questions is whether or not Stephen Paddock had help in carrying out the massacre. Was he part of a wider plot? Many witnesses and survivors of the shooting claim to have seen more than one shooter and to have heard more than one gun shooting at times simultaneously with distinctly different sounds and rates of gunfire and muzzle sounds. The logistics of the attack also suggest that Paddock had help as a few hundreds of pounds in weapons, ammo and explosives were involved and very few people believe that Paddock (age 64) could have accomplished all the things he is said to have done to prepare his room for the attack, including lugging more moe than 20 weapons of various types, plus thousands of rounds of ammo and even high powered explosives in his car. Meanwhile, authorities seem dumbfounded and slow (or loath) to react to eyewitnesses’ accounts while they are still “floating” 2nd shooter debunking stories. For example, The Sheriff said October 4th that what the videos show, i.e. capturing a 2nd shooter, was actually a strobe light or reflections. “It was a strobe light” mistaken for machine gun fire, or that people were “mistaking reflections from the windows of the hotel” for rifle fire. There were multiple gunmen, at least 4, shooting up Las Vegas that terrible night, October 1st, 2017. 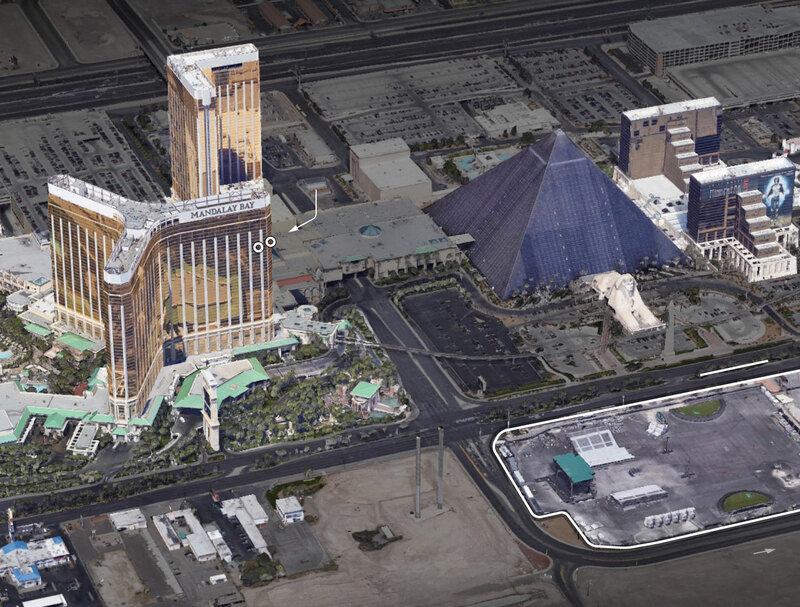 Two were shooting from the Manadalya Bay Hotel and the others attacked the front entrances of the Bellagio, Tropicana, Planet Earth, Hustler's, and the Flamingo Hotel. 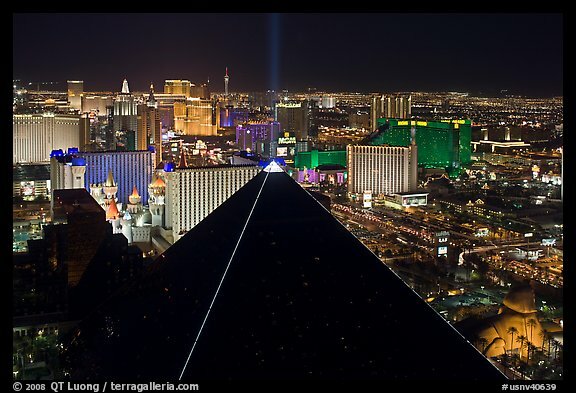 With regard to astronomy & astrology, what we have on October 1st in the sky over Las Vegas was the approaching Harvest Moon (an ancient pagan feast day) and when viewed from the concert arena, the unique sight of the alignment of the star "VEGA" in the constellation Lyra in transit stationed precisely above the Black Pyramid at the time of the attacks . The term Al Nesr al Waki appeared in the Al Achsasi al Mouakket star catalogue and was translated into Latinas Vultur Cadens, "the falling eagle/vulture". The constellation was represented as a vulture in ancient Egypt, and as an eagle or vulture in ancient India. The Arabic name then appeared in the western world in the Alfonsine Tables, which were drawn up between 1215 and 1270 by order of Alfonso X. Medieval astrolabes of England and Western Europe used the names Wega and Alvaca, and depicted it and Altair as birds.Each night the positions of the stars appear to change as the Earth rotates. However, when a star is located along the Earth's axis of rotation, it will remain in the same position and thus is called a pole star. The direction of the Earth's axis of rotation gradually changes over time in a process known as the precession of the equinoxes. A complete precession cycle requires 25,770 years, during which time the pole of the Earth's rotation follows a circular path across the celestial sphere that passes near several prominent stars. At present the pole star is Polaris, but around 12,000 BC the pole was pointed only five degrees away from Vega. Through precession, the pole will again pass near Vega around AD 14,000. It is the brightest of the successive northern pole stars. The path of the north celestial pole among the stars due to the precession. Vega is the bright star near the bottom. Since anicent times, Vega has represented a predator, an eagle or a "Falling Vulture." Vultures feed on carrion, i.e. dead flesh. Vultures also prefer open fields for preying. Aerial view of Mandalay Bay, Las Vegas, Nevada. I’ve corellated the videos linked below with this external photos of the hotel to triangulate the postion of the 2nd Mandalay Bay Hotel shooter who fired from a low platform atop the green roof porch shown above. The Las Vegas Taxi Driver’s Video caught a shooter firing from the lower floor of the Mandalay Bay from a very close vantage point, i.e., pulling out of the Mandalay’s Drive-Though entrance. I believe that this is indisputable proof and is consonant with the 1st video that I posted on Facebook & Twitter earlier, i.e. the stable video shot from the hotel across the street. I’ve compiled all the links together below. 2 - Video from the hotel across the street. By using the the cornered angles of the canopy roof structure that covers the hotel's passenger drop-off area and overhangs toward the exit road I was able to determine with precision the exact position of the vehicle and the camera angle to the shooter, and thereby, place the shooter on the balcony that crowns the entrance, above and behind the "Green rooftop" seen in the arieal photo of the Mandalay Bay. By comparing frames and correlating the driver's position and the camera angle to the shooter's position (indicated by the gun flash) in that frame, and using a triangular section of the unique roof (poviding two 90 degree angles for precise referencing, I was able to calculate the shooter’s position to be outside the hotel and shooting from a balcony that covers the drive-through entrance of the hotel. This explaiins how there would be NO broken windows on that level or that side of the hotel. However, windows are NO PROBLEM when the SHOOTER was standing OUTSIDE on a the balconuy of the roof that covers the entrance to Mandalay Bay. Reporter Laura Loomer and her team found a bullet impact om a concrete block wich left a track mark distinct enough to use a laser to backtrack the trajectory. BETWEEN TIME MARK 4:39 AND 4:52, WE CAN HEAR THE SOUNDS OF TWO (2) SEPARATE AND DISTINCTLY DIFFERENT AUTOMATIC WEAPONS, EACH FIRING AT A DIFFERENT RATE OF FIR, ONE FASTER THAN THE OTHER. THE SOUNDS COMING FROM ONE OF THE WEAPONS ARE LOUDER (WITH A DEEPER SOUNDING REPORT, INDICATIVE OF A HIGHER CALIBER WEAPON) AND ONE SOUNDS MUCH CLOSER THAN THE OTHER. Listen to the audio closely and study the characteristics of the sounds that were recorded between Time Mark 4:39 and 4:52. We can clearly hear the sounds of TWO (2) separate and distinct automatic weapons, each firing at a different rate of fire, one faster than the other. The sounds coming from one of the weapons is distinctly louder (with the deeper sound of a higher caliber weapon than a .223 caliber/556 mm round). If the listener plays the Arch Angel video sequence above (from 4:39 to 4:52), he will hear both guns firing at the same time. The sounds and rhythm heard in the bursts of shots in different sequences are distinct in sound and with a different and disparate rate of fire to be heard between the 2 guns, one automtatic weapon firing much faster than the other. The video proceeds with the sounds of sporadic fire in the far distance, but then again at time mark 12:33, we can hear the sudden and loud crackling of 2 automatic weapons firing simultaneously, which once again present distinctly different sounds to human ear and the discordant sequence of the firing proves again as in the previous section (4:39 to 4:52) that 2 guns are firing together simultaneously. In the sequence, (starting at 12:33) both guns begin to fire almost at the same moment (as if being directed by radio from a central coordinating command). Below is a report by contributor, Alexandra Bruce (Forbidden Knowledge TV), regarding the reported “lock-down” of the Bellagio Hotel shown in the video below. “I was alerted about this video by a subscriber whose brother drives a limousine in Las Vegas. He’s spoken to several other drivers and bellmen at the Bellagio, the Flamingo and other hotels surrounding Mandalay Bay. All reported that their lobbies were shot up last Sunday night. This indicates that more than one gunman was involved in the horrifying events that evening. Besides the many eyewitness reports from members of the public, a police officer also urgently confirmed that there were at least two active shooters in the Mandalay Bay. “CONFIRMED there are at least 2 shooters with fully automatic weapons,” a police officer reported at 18:54 in the recording. Multiple scenes then developed across Las Vegas, with police reporting and confirming multiple active shooters at the Tropicana and New York, New York Hotel-Casino (NY, NY). “CONFIRMED – Giles and Alibaba, casualties, East of the Catholic Shrine. SO WE HAVE TWO SCENES!,” said another officer at 38:30 in the recoding, confirming that there were casualties at Giles and Alibaba, a location out of range of Stephen Paddock’s gunfire from the Mandalay Bay. MIke Adams present a brilliant analysis of the acoustical evidence of the shooting to prove the presence of a 2nd shooter and his relative distance from the venue and the other shooter. One of the unusual items discovered in Steven Paddock’s room was an electric charger that did not belong to the deceased. The FBI seized the charger and traced it to a man named John Beilman who lived inFairport, New York, a suburb of Rochester. “According to this report, upon the FBI searching the Mandalay Bay Hotel room used by CIA gun runner Stephen Paddock, a cell phone charger was discovered that had no accompanying phone—with SVR technology experts noting that this type of charger is used to charge a CP502520 3.0V 600mAh Li-MnO2 Non-rechargeable Thin Cell Battery used in various communication devices by both US Special Forces and CIA forces. And that was followed 48 hours later (6 October) by the Pentagon awarding Ultralife Corporation new contracts valued at over $49 million. In closing, I would state (unequivocally) that The Las Vegas massacre, the worst gun assault carried out against modern day America, was a well-planned terrorist act in which at least 2 shooters fired on a helpless crowd from the environs of the Mandalay Bay Hotel while at least 2 other gunmen (with drivers) attacked the Bellagio, New York, New Yorkand Flamingo Hotels, which lie not too far away from the Mandalay Bay Hotel, about 1 and quarter miles away in the case of Bellagio. “There was a lady who pushed her way forward into the concert venue and into the first row, and she started messing with another lady, and told us that we were all going to die tonight,” Hendricks told KSNV. Hendricks and her mother left the concert before the shooting began, and heard the shots ring out just as they returned to their room. “Obviously she was telling us that — either to warn us, or to warn us that we were all going to die and she was part of it,” Hendricks added. Hendricks described the woman and a man she was with as Hispanic and about 5-foot-5. When asked why the pair had been escorted out, Hendricks replied: “Because she had been messing with the lady in front of her and telling her that she was going to die. That we were all going to die." This sounds to me like an intentionally staged event. The Hispanic lady began "mussin" with another lady's hair. There is a video on YouTube showing this unusual event fom a distance and it appears that it was loud, and confrontal, but not violent. The video shows that a lady in front row had her hair up in a bun and the person in question began to push on her hair bun with her hand in an annoying way. That's when the fracas broke out, turned to shouting, aand a bi of shoving but without intensity as he woman's partner, a man staning outside the reestraining fence and not standing in the audience. The shouting grows louder with the Hispanic woman uttering her warnings (or threatsz) ultimately bringing a security detail to stop the altercation by ejecting the couple, the Hispanic woman an her companion, and escorting them out of the venue withot any resistance or protest. Multiple eyewitnesses to the scene rendered the same or a similar description. Those 2 people were not an Arabic couple, but an Hispanic-looking couple. Ssheriff Lombard is asked a question relating to the Gunman's Stephen Paddocks' car. Following the press conference for the investigation of the Las Vegas shooting, some YouTubers have discovered something unnerving in the video clip where Clark County Sheriff Lombard is asked about Stephen Paddock's car. When Sheriff Lombard is asked a question relating to the Gunman's Stephen Paddocks' car, someone allegedly whispers "Don't go there". Lombard, who is visibly disturbed by the question responds "Don't ask me to make assumptions, please". The Sheriff caused a meltdown at the press conference when he suggested that Paddock "didn't act alone". South Carolina Republican, Trey Gowdy, also mirrored Lombard's theory when the host, Martha MacCallum, he was "skeptical" that gunman Stephen Paddock, could have acted alone without the help of another person. Gowdy also predicted that he would be "proven right" that Paddocks wasn't alone in the coming days of the investigation." We should also take note that the trend in the current mass media news reporting cycle of "the official narrative" appears to be following a script of casting suspicion simultaneously on ISIS while at the same time propping up authorities' comments denying the participation of ISIS in the slaughter. In short, they are practicing Orwellinan "New Speak" and "double talk." Having watched these tactics employed for more than 50 years now, this writer recognizes such "New Speak" and "double talk" as a sign typical of CIA-MK-Ultra mass mind control methods used (many times before, facilitated via CIA's Operation Mockingbird) to create confusion, i.e., cognitive dissonance, in anyone who is listening except those who are inured and can recognize such neurolinguistic programming techniques when they are being applied to befuddle, manipulate and distort public perception of events. This kind of reportage was used throughout the the JFK/MLK/RFK Assassinations, and the during the 911 Attacks and in days following, particularly in regard to the Shanksville crsh site and and government obscuration of how that airliner really came down. Motivation, intention, resources, opportunity, stealth and proximity to the victim(s) are essential for a sucessful terrorist assault. As to motivation, intention and resources, these afoementined terrorist oranizations all share an inveterate hatred for the Unitd States and the American people. In that, they are all the same, and one might justifiably suspect, engaged in a "joint venture." However, as to opportunity and proximity, the Zetas' AOR (area of responsibility), i.e., their territory and their resources are the closest with easy access to the target area. Furthermore, at the moment, some degree of desperation may be setting in as the Zetas are under relentless attack on both sides of the border by the Trump Administration, and with the prospect of "The Wall" blocking their trade routes into the US market, the Zeta's are zealous and highly motivated to strike terror into the very hearts and minds of the Amercian people. The pressure that President Trump is putting on the Mexian government is bearing down on them and the US Border Patrol unshackled from the tethers and restraints of the Obama Administration pro-narcoterrorist border policies, the fuutre for the Zetas looks very grim indeed. The "Gangbusters style" of prosecution that has been the hallmark of Attorney General Jeff Sessions' use of the Department of Justice and the FBI in dismantling "M-13" by arresting, jailing and deporting members of the vast MS-13 narcotrafficking gangs, i.e., the Zetas distribution network across the U.S. is being destroyed and that surely puts The Zetas high on this reporter's on the suspect list. Not a word of "Alllahu Akbar" Heard In Las Vegas? Has there ever been an Al-Queda or ISIS attack anywhere where the words: "Allahu Akbar" weren't heard or squealed by a dying suicide bomber? I can't recall any major attacks by Jihadis when the terrorists weren't shouting or squeaking "Allahu Akbar" (which by the way has been designated a capital crime by the Italian Government, which has called upon Italian Carabinieri (police) to shoot on sight ANYONE who utters, screams or yells out "ALLAHU AKBAR" in any public setting! If ISIS or Al-Queda are to blame for this massacre, that would make the Las Vegas attack the first major attack in which the words "ALLAHU AKBAR" were not heard (exept on Twitter). This point reinforces my observation, made previously, regarding the significance of the altercation that occured in the crowd 45 minutes before the shooting started. It is clear that the words "ALLAHU AKBAR" nor anything akin to them were heard by anyone in the crowd. If they were, it was not and has not been reported. I think that the reader would agree that foreknoweldge of such a dastardly event would clearly imply that an association existed between those who knew before the event and those who perpetrated the deed. All reports describing the 2 people who were caught up in the dispute and removed from the venue were described as a "Hispanics," namely, man and a woman about 5 feet 5 or 6 inches, who was described as the instigator of the fracas and who shouted with an Hispanic accent. And here, we face another paradox. and paradooxically, the Las Vegas Police & FBI deny and dismiss it, but is an established FACT that ISIS' Warned 2 American Cities of impending attacks more than a week before the Las Vegas attack and Las Vegas was shown to be an intended target in the video warning. It is an established and ecorded fact that more than a week before the killings, ISIS issued a dire and menacing warning to Las Vegas and to the city of San Francisco via Twitter that attacks were planned for those cities in the very near future. NBC News in Las Vegas carried the report and did an extended feature story with city and police officials commenting on the implied threats, but diminishing their importance, if not dismissing them altogether. This writer has seen that report several times and would note for the reader, that the ISIS warning (picked up on Twitter) threatening both cities, chose to show San Francisco's Golden Bay Bridge to represent San Francisco, and remarkably, showed a panoramic photograph of The Black Pyramind-Madalay Bay Hotel area precisely where the massace would occur about 10 days later. Was Las Vegas a Terrorist Co-op or an FBI "Sting Operation" Gone Wrong? It is possible, given the networking nature of terrorist cells, that more than one terrorist organization was involved. In fact, given the wworld wide terrorist communications in drug smuggling and arms dealings, it would not be unreasonable to believe that ISIS or Al-Queda could have contracted technical asssistance from the Zetas to conduct the operation. Or any one of them could have been lured into a planned FBI sting in which Steven Paddack was acting as a go-between for the FBI in arranging an arms sale that would have been the basis of the "FBI Sting Operation,"
It has also been discovered that Steven Pollack journeyed overseas more than 20 times and that he visited Jordan and the United Arab Emirates, where he could have been radicalized by ISIS or some other terrorist cell. Or he could have been there on a covert mission for one of our intelligence agencies, either the CIA or the FBI. he possibility that this was another case of “Fast & Furious” gone wrong is not out of the question, and quite a reasonable explanation for “what went down” that igh in Las Vegas. It is important to note, as we have learned in recent years, that ISIS was created and funded by the US, Israel and Jordan who set up an operational headquarters in Amman, Jordan to oversee the creation of ISIS to establish a “SALAFIST PRINICIPALITY” (quoted from a leaked Pentagon memo of August 2014). This so-called “Salafist Principality” is one and the same “Caliphate” of Abu-Bakir al-Bagdhadi (i.e. the ‘Salafist prince” referred to in the Pentagon memo) that the Obama and Clinton State Department wanted to use to destabilize Syria and depose Bashar Assad. The Pentagon memo was released last year during the Presidential campaign by WikiLeaks founder, Julian Assange. 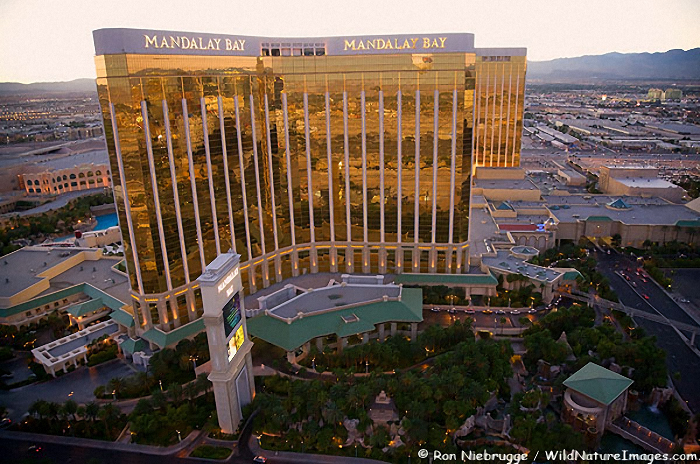 1- Aerial view of Mandalay Bay, Las Vegas, Nevada. I’ve corellated these 2 videos with external photos of the hotel to triangulate the postion of the shooter. This Las Vegas Taxi Driver’s Video caught a shooter firing from the lower floor of the Mandalay Bay from a very close vantage point, i.e. pulling out of the Mandalay’s Drive-Though entrance.This is amazing…I believe that this is indisputable proof and is consonant with the 1st video I sent you earlier, i.e. the stable video shot from the hotel across the street. I’ve put both links together below. Between Time Mark 4:39 and 4:52, we can hear the sounds of TWO (2) separate automatic weapons, each firing at a different rate of fire, one faster than the other. The sounds coming from one of the weapons is louder (with deeper sounding report of a higher caliber weapon) and one sounds much closer than the other. 3- Video from the hotel across the street. I have calculated the shooter’s position to be outside the hotel and shooting from a rooftop that covers the passanger drop-off area of the entrance of the hotel. 4- Taxi lady’s video captures unique shots that are on NO other video or audio captured at such close range. However, there are 13 faint shots fired that she describes as "far away". This audio analysis proves beyond doubt that there were more than one gunman shooting and several times firing at the same time. NO other video captures them. So they were either INSIDE the hotel or South of Mandalay Bay. The gun sounds are like those of an AK-47 or and M-240 belt fed machine-gun, for at least 9 of the 11 volleys. If you were hit with that it would leave a big hole. However, the pictures of Paddock's room contained only AR-15s, which fire .223 caliber ammo (aka 556 mm. NATO rounds). The majority of injuries appear to be more consistent with AR-15, not AK-47 round. Lag time between the arrival of the shots and the report of the weapons proves the presence of 2 shooters who were firing from different distances 400 meters and 250 meters. 6. Rocky Palmero’s Wound Proves Shooters Were Inside the venue and Soros Financial Investments in the Las Vegas Attacks. Octoberfest is a Christian derivation from an ancient pagan harvest ritual. We in this country, in this generation, are by destiny rather than choice, the watchmen on the walls of world freedom. That must always be our goal and the righteousness of our cause must always underlie our strength.